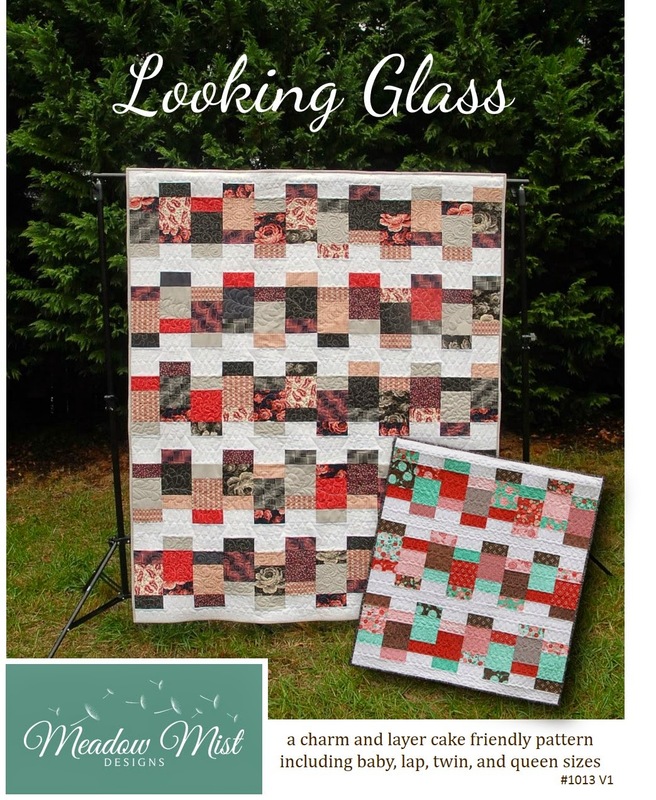 I am happy to introduce the Looking Glass Pattern and Blog Hop today! 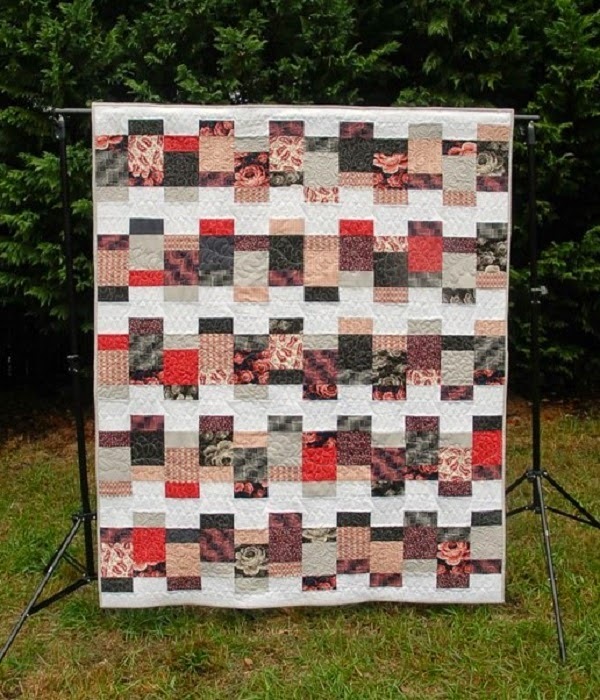 The pattern is very charm pack and layer cake friendly and contains instructions for baby, lap, twin, and queen sized quilts. My original version was the baby sized quilt using the Into the Woods collection by Lella Boutique for Moda. For the hop, I made a second version, the lap size using some of the red and pink prints from the Greenfield Hill collection by Densye Schmidt for Free Spirit. These fabrics were from my local quilt guild and this quilt will be going to our guild's charity. I did not have enough of the prints so I added in some Kona ash and coal. I quilted the white areas in a figure 8 design and added some feathers and swirls to the print areas because I just took a feathers class and was looking for an excuse to practice them. To introduce Looking Glass, the pattern will be available in my Etsy shop and Craftsy shop for $5.50 for 2 weeks (through Monday Friday December 5th) before it goes up to its regular price. Thanks and I hope you enjoy all of the reviews versions over the next week! If you decide to make anything from a Meadow Mist Designs pattern or tutorial, I hope you will consider adding it to the Meadow Mist Designs flickr group and/or use the hashtag #MeadowMistDesigns when sharing on Instagram. I am linking up to Link a Finish Friday, Whoop Whoop Friday, Thank Goodness Its Finished Friday, Finish It Up Friday, Fabric Frenzy Friday, Sewjo @ My Go Go Life, and Show Off Saturday @ Sew She Can. I really love this pattern and can't wait to show mine off to everyone next week. Nice quilting; the grays were a good addition. Always happy when a need creates a better design. First your fantastic block in the magazine, and now this super versatile and easy-looking pattern! This is a very inviting quilt design! Great pattern - I love the DS version! Well done. That must be so exciting. Congrats! Congrats on the release of your newest, lovely pattern, Cheryl! I love the version made using the Into the Woods line, but can imagine so many fun possibilities with your great design. Congrats! I would like to make mine with Christmas fabrics. An easy, quick pattern that is full of color. I like it. What a fun pattern! I'd love to make a quilt with this pattern! Wonderful here too...you got the feathers down as well as the swirls! 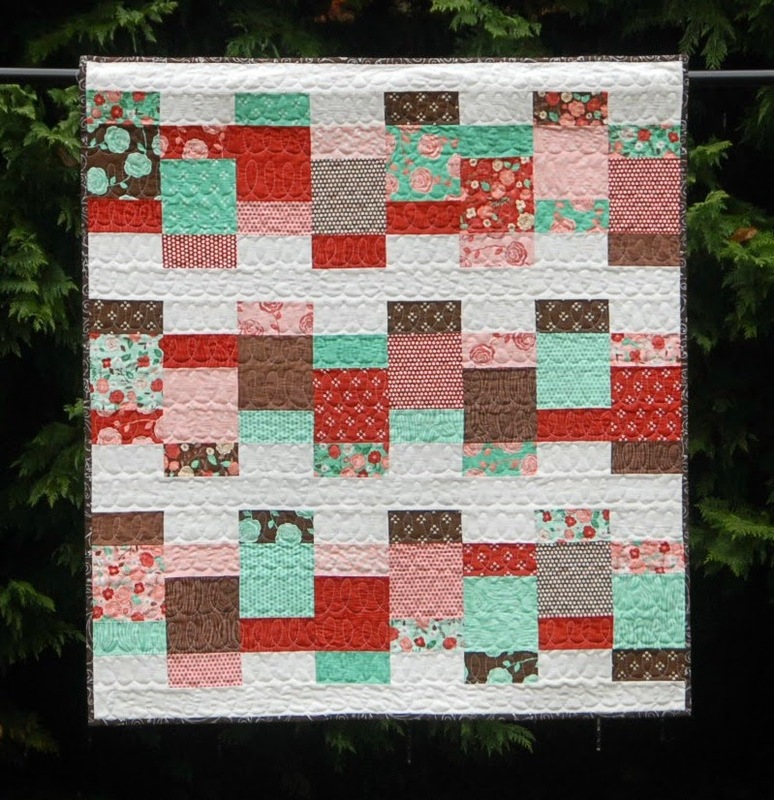 I love the mixing of the quilting patterns in your new pattern.